The New King James Version® is a modernization of the King James Version of 1611. It preserves the KJV’s dignified style but replaces words and expressions no longer easily understood. This is Cambridge’s first Bible in this increasingly popular translation. It is a center-column reference Bible in the established Pitt Minion format. 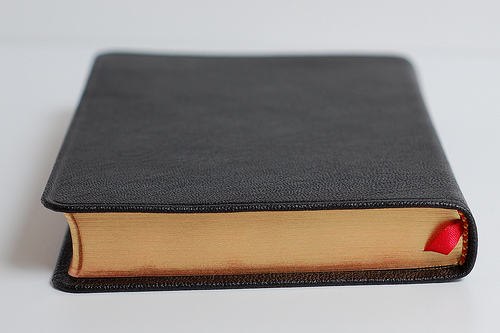 The NKJV Pitt Minion Reference Bible is compact, yet its type is still large enough to read comfortably. It features red-letter text and includes full cross-references, a concordance, and color maps. Printed in the Netherlands on high-quality India paper, it is Smyth-sewn and bound in a choice of fine leathers, including goatskin. I read a lot about this little Bible before getting it. Mark Bertrand\’s site was very helpful, but I also read more user reviews elsewhere that were fairly critical of the small print. I had fortunately taken a look at an NASB Pitt Minion at a local store before purchasing this, and thus wasn\’t surprised at the size–it\’s perfect. I don\’t have any problems reading the type (but I am also younger). This will make a great daily reader, traveler, and church Bible (rather than lugging a behemoth). I will continue to study from a larger Bible, however, since the margins in this Bible leave little room for notes. As indicated in every review I have read the quality of the Bible is second to none. The goat skin is soft and supple. 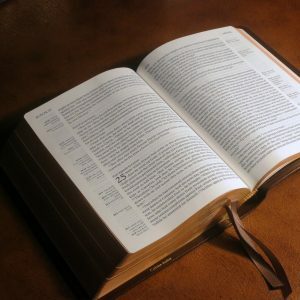 The book opens flat–even in the book of Revelation! Magnificent to hold and carry! Just received this bible, although the type is small i just put on my glasses. This is really a beautiful bible, I love it. Great to carry. It is very compact. Straight out of the box, the feel was majestic! Beautifully bound, it laid flat on the table for my first reading. Weeks later, the Bible increasingly feels better in my hands. The print is a little small for public reading, but is excellent for personal devotional reading. This Bible is great for what\’s meant for…moving. The Cambridge Pitt Minion NKJV is a very nice Bible, but it’s definitely not perfect as some would have you believe. There’s two problems that I have with this Bible: one, it’s not as big as the pictures make the Bible appear. The pictures sort of gives the impression that it’s a regular sized thinline Bible. It’s not. I know the dimensions are posted on the web site, but I wish it was just a little bigger. And two, the paper curls up around the edges after only being open for about 2 minutes. I think I’ve seen cheaper Bibles with better paper than this one. If you’re not careful you’ll close the Bible on one of the curled up pages and bend them. Before closing the Bible I have to flatten the pages out. Other than these two issues, I really like this Bible. Perhaps if there was an alternative I would return and buy another Bible, but I think this one is the best of the best for it’s size. 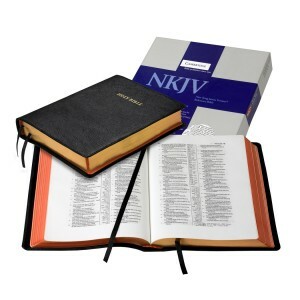 Lord willing Schuyler Bibles will produce a thinner NKJV that’s suitable for carrying. I have the first print of the Schulyer NKJV and I think it’s the best Bible available, but it’s too big to carry everywhere I go. So the Cambridge Pitt Minion NKJV it is! I had previously owned the calf split version and loved it. It didn’t take long to break in. This time, I went for the black goat skin and it’s truly a gem! Not the same supple feel you get with an Allan, but plenty flexible for laying flat right out of the box. The card under the liner would be the reason for the stiffness. In all truth, for the purpose I use a Pitt, a leather lined may not be the best choice. Regardless, I love it as is. The art guild is Cambridge beautiful as always. Several reviews stated the black goat had only one ribbon. However mine came with two beautiful and bright red ribbons. I would highly recommend a Pitt Minion to anyone wanting a small, portable and complete Bible!!! This NKJV is my third Pitt Minion, along with an NASB and an NIV84. My 3 sons will inherit these. The quality is top-notch right out of the box. I’ve had others ask about another Pitt and say, “Is that the whole Bible?” Yes, and the size is perfect for travel or carrying. But more than that, EVB’s service is just phenomenal. I ordered this at 4 PM Eastern on 11/21, and it showed up today, 11/24. Essentially 2 days mail time, since Thanksgiving is sandwiched in there. Amazing. I’ve purchased 5-6 Bibles from EVB. If the service was poor, I’d still buy from them, since the quality is outstanding. Combined with awesome service, you cannot go wrong. Waiting on the Messianic NIV Schuyler that’s soon to come out!! Someone once (jokingly) defined mixed emotions as watching your mother drive off a cliff in your brand new Ferrari. This is kind of how I feel about my new Cambridge Pitt Minion NKJV in black goatskin. I can certainly attest and agree with every positive review made of this little bible. The binding, red under gold gilt, ink, India paper, references, concordance, and maps are truly excellent. But we’ve come to expect that from Cambridge, haven’t we? My biggest complaint is the terribly small 6.75pt Lexicon No. 1 font Cambridge selected. I must be honest here – I cannot claim that I was unaware of the small font used in the Pitt Minions. 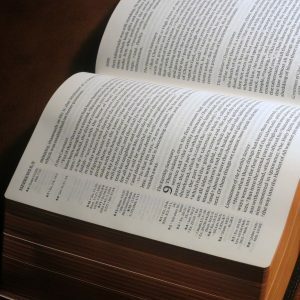 I had read and re-read many Pitt Minion reviews both on evangelical.com and elsewhere, and so I was well apprised of the small font of these bibles. But I was so hoping that I would be one of those who could claim that the small font is no problem. Well, if I were 30 or 40 years younger, the small font probably would not be a problem. But I am rapidly approaching my threescore and ten, and my eyes just aren’t what they used to be. However, in all fairness to Cambridge, if I wear my spectacles and read in adequate light, the small font is not much of a problem at all. All of my bibles (Thomas Nelson NKJV Open Bible, Schuyler Quentel NKJV, Schuyler Quentel NIV, Schuyler Canterbury KJV) are truly marvelous and wonderful for reading at home where I can hold them comfortably in my lap. But they are rather heavy and somewhat burdensome to carry to church. Since I received my Pitt Minion, I have taken it to church and Sabbath school class several times and it has been wonderful! Small, easy to carry, and, because I wasn’t reading more than one or two chapters at church, it was a real pleasure to have with me. And I absolutely love being able to hold the open Pitt Minion comfortably in one hand for extended periods of time without growing tired. But that small font! Couldn’t Cambridge have used an 8pt font in the Pitt Minion? It then would have probably been about the same size as a Cambridge Cameo, which is probably the most perfectly sized bible in the world. 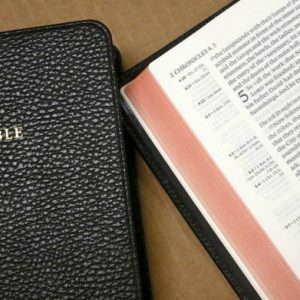 I recently pre-ordered from evangelicalbible.com the soon-to-be-published Schuyler Personal Size Quentel NKJV in 8.5pt font in hopes that it will serve me well both at home and at church. So this is my dilemma – what do I do with this beautiful little Pitt Minion? Shall I keep it and make it my exclusive church bible, or give it to someone with stronger eyesight (like one of my children)? Would I buy it again? For myself, probably not. Would I recommend it to others? Absolutely! Even with the small font, the Cambridge Pitt Minion is a truly exquisite bible. Talk about mixed emotions!